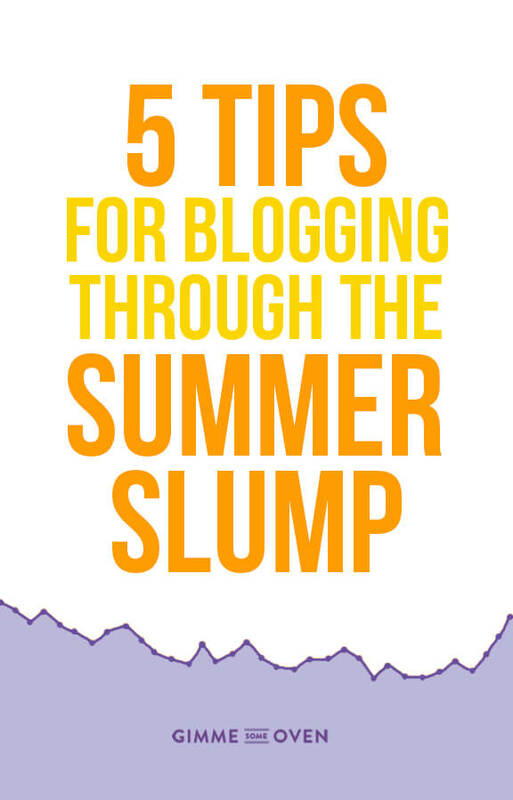 5 Tips For Blogging Through The "Summer Slump"
Bloggers, it’s about that time again. …it’s time for the “summer slump” in the blogging world to begin. This looks different for every blogger, of course. Different years, different blogging niches, different traffic patterns, different Google algorithms, and a hundred other different variables affect individual blogs from summer to summer. But in general, it’s pretty predictable annual pattern — when the weather warms up, people want to be outside. Which means that people spend less time inside, less time on their computers, and less time on blogs. Which means that the blogging industry as a whole tends to take a dip — both in terms of traffic and often in terms of bloggers’ incomes — during those summer months. I call it the ol’ summer slump. Well, to all of them, to myself, and to any of you who might start be feeling all doubt-y or discouraged or disillusioned or disheartened or any of those other dis-‘s during the summer months — take heart. Blogging is a roller coaster and these downs come with the ups. A summer slump won’t last forever, and totally shouldn’t take away from the joy of summer. I mean, seriously, summer is my favorite season! It’s when we get to wear flip flops and drink iced coffee and swim in the lake and go for warm walks in the evening. It’s when we get to cook with fresh ripe tomatoes and bake warm loaves of zucchini bread and saute up colorful peppers galore and pop red juicy strawberries like candy. It’s when we get to sizzle up steaks on the grill and bring pasta salads for picnics and enjoy frozen margaritas on the deck with friends until the fireflies come out. It is not the time of year when bloggers should have to feel pressured or anxious or discouraged by an annual trend in our industry. No way. If it were up to me, Google Analytics should never have the power to cast a cloud over anyone’s sunny, warm, delicious summers. But still, having been through a handful of summer slumps myself in the past, I fully acknowledge that they can be hard at times on bloggers. So today, I thought I would share 5 of my favorite tips for how to blog through the summer slump. Or even better, how to enjoy blogging through the summer slump. Trust me, it’s totally possible. Don’t overanalyze. Don’t make rash decisions. Don’t freak out. Don’t panic. Because summer slumps are totally normal in blogging. Frankly, if you don’t have a summer slump in traffic or comments or social media engagement or income — you lucky duck, you — I’d say you’re in the minority. Because statistically, the blogging industry as a whole tends to take a consistent dip in traffic and engagement during the 2nd and 3rd quarters. Thankfully, for those of us who monetize our blogs via ads, CPM rates tend to do better in the summer than they did in the 1st quarter, so your income may level out even if your traffic is lower. But still, if your blog is hit by the summer slump and your income dips, it’s important to always remember that this is an industry trend and you’re not alone! Also important to remember? The summer slump is not a time to panic and make rash decisions. Think of it as the blogging equivalent to making important decisions after 9pm. All adults should know by now that this is never a good idea!!! (Although let’s be real, 11:59pm always seemed like the perfect time in college to send that 3-page email to your crush confessing your undying love, right??) NO. Resist the urge. Don’t do it. Big decisions (and emails) can always wait until morning. Just like making big decisions about your blog can always wait until the fall, when the summer slump miraculously transforms into back-to-school, meal-planning, holiday-preparing, wonderfully-high-traffic season. The best decisions in life come out of seasons of excitement and confidence and joy, not fear and anxiety and panic. So wait it out. And remember you’re in good company with other cool bloggers doing the exact same thing. 2. Use this time to work on longer-term projects. Heck yes! Summer is the perfect time to work on longer-term projects. And if you don’t have anything else brewing behind the scenes of your blog just yet, summer is the perfect time to also come up with some new longer-term projects. For example, how about that cookbook you’ve been wanting to write? Or that partnership you would like to explore? Or that course you’ve thought about creating? Or that new software you’ve been wanting to conquer? Or that research trip you’ve been wanting to take? Or that new series you’d love to launch? 1) It’ll pull you out of the weeds of the day-to-day statistics of summer slumpy-ness and give you some exciting longer-term goals to work toward. So if blogging gets you down, you’ll have another motivating project to fall back on. 2) Quite frankly, if your summer blog posts aren’t getting that much traffic during the summer, it might actually be wiser (from a business perspective) to invest more time into some longer-term projects if you think they might be more successful overall. Totally depends on the circumstances of course, but if your traffic’s down and you’d rather be spending time writing a book that you think could be profitable, then summer could be the perfect season to focus more of your efforts there. Either way, always remember — blogging is a marathon, not a sprint. So spend some time thinking about what you’d like your blog and your lifestyle to look like over the coming months and years and decades, and then make plans to start moving in that direction. 3. Experiment! Take risks! Carpe blog! I’m also a firm believe that summer is a fantastic time to try some new things with your blog. Experiment! Take risks! Seize your blog! When traffic is high, bloggers tend to want to play it safe and stick with content that they know will yield home-runs. (No judgement there — that’s how I tend to roll.) But hey, if things take a dip in the summer and some readers check out on summer vacation, use that pressure-free time to test out some new stuff and see how it flies!! So don’t play it safe. Gear up your courage and do something that intimidates you! Something that’s a little risky. Something that’s a little vulnerable. Something that’s a little different. Something that’s a little scary. Something that’s a little extra awesome. 4. Devote time to behind-the-scenes stuff. Some of the things on my list for this summer? 5. Enjoy some time off. And by that, I mean legit time off. Not the go-on-vacation-and-“just-check-in”-on-your-computer-10-times-a-day sort of time off. I’m talking the for-realz, out-of-office-responder-on, blog-posts-scheduled-ahead-of-time, no-checking-social-media-on-your-phone, come-back-to-your-comments-later, take-a-break-from-having-to-blog-about-everything-and-just-be-inspired-by-life glorious kind of time off. Posting one less time per week during the summer: Chances are you won’t even see a dip in your traffic. And the extra time can allow you to do more of #2, #3, #4 and #5. Taking an extra day (or two) off from your blog each week: Turn Fridays into Fri-yays! Or take the weekends completely off! Or if you hate Mondays, have a screen-free start to your week. Then, make fun plans on those days (or relaxing plans if that’s more needed) so that you don’t fall back into old habits and fill them with work. Heck, taking an entire month off from your blog: You can either do this by planning in advance and scheduling out posts for a month. Or you can just take some old-fashioned time off and (gasp) just not post for a month. I have friends who have done this and swear that it’s life-changing. I’ve got to make it happen! You need time off. Lest we ever forget, it’s how humans are designed. We need lots of rest — like, as many hours of rest in a day as we’re supposed to work in a day — in order to feel energized and inspired and recharged. So even if you are a pro at “powering through” and getting oodles of stuff done, do yourself a favor during the summer and close those screens and take some legit time off. I can guarantee you’ll come back with a more interesting life to write about, and you’ll likely miss blogging and genuinely enjoy getting back to it all the more. You deserve time off. On that same note, most bloggers I know are super-hard workers, and pour incredible amounts of time and energy and heart into their work. I’m one of them — blogging is something I love to do, and I give it my all. However, like with any other job, working hard earns you time off. So don’t be that crazy boss to yourself that you would never want to work for — give yourself the time off you deserve, and then take those vacation days! Your readers want you to take time off. On that note, I would also like to point out that your readers are also real, wonderful, reasonable people as well. And they don’t want their favorite bloggers to be workaholics. No, they want you to enjoy time off! I feel like I have to remind blogging friends of this all the time when they’re afraid about “missing a post” or being late with something — your readers are not out to judge you or be your crazy taskmaster. They’re in this with you. So if you take off for a week or two on vacation, tell them, and they’ll probably be the first ones to encourage you to go. And hey, be sure to also cheer your fellow bloggers who might be experiencing some degree of a summer slump. We’re in this together, and we’re in it for the long haul with many more summers ahead. So cheers to a great season ahead. You’ve got this! This is so refreshing! It’s good to know that the summer slump is in fact real… I haven’t been blogging long enough to truly know that myself, but I have heard that traffic in general is lower during the summer. I like the idea of working on long-term projects while traffic isn’t quite as high. Actually, I like all these ideas. Thanks! Oh, this is great! I wasn’t aware of this “summer slump” – my blog is still a bit too young to notice a significant pattern like that. But I’m glad I read this before I was all like “WHAT IS HAPPENING” in a month or two. I feel like I’ve been going 100mph with my blog for the past few months, so this was a nice little wake-up call to tell myself to slow down and work on those side projects for the blog over the summer. Thank you! Such a great post. I love all the tips and advice you provide, especially for someone who’s so new to the business like me! I gotta be honest, I’m kinda surprised (and extremely relieved) for how much time you encourage bloggers to take off. But you’re so right! Everyone who is their own boss has to be able to give themselves a break every now and then and relax. And I totally agree, if/when I’m away from my blog, I conjure up so many ideas and recipes and then I’m excited and eager to get back to it. Good rest does the body good! Thank you for putting so much time and effort into this post, very helpful! Ali, I totally needed to read this right now! I’m already feeling the slump; thanks for the great ideas and inspiration! Great tips, especially for a new blogger who is approaching their first summer blogging! Dun dun dun. I’ll definitely be referring back to this post if I get into s slump. Keep up the awesome work girlfriend! Love tips 2, 4, and 5! Thanks for sharing this encouragement, Ali. Pinning this one. Bring on the flip flops, iced coffee, and fresh garden produce! As it just would have it, the ad at the very bottom (at least on my computer screen) after your post says “Wear Better Underwear” and it just seemed like it ended your post really well. Turning Fri-days into Fri-yays? There’s a meme just waiting to happen. :) Great post! I’m sure you’re “slump” looks different than my “slump” but a slump is still a slump. I appreciate the pep talk. I’ll let you know if I do anything crazy! I’m in the process of having Purr redesign my site and I’m looking forward to launching it mid-May… that might qualify as crazy to me! Wonderful tips thank you for sharing! Oh yes – I am already slumpping :( But I am going to make myself a long to-do list to make sure when the summer is over my blog booms! Bless you Ali! Thanks for sharing your wisdom! Great tips and reminders! I am currently working on a site redesign and have been busy reformatting recipes and getting ready to launch and summer isn’t even here yet and I am beginning to feel burned out. I need to take some time off so I can focus on my redesign and not try to do both at once. This is a perfectly timed post. Thank you!! You’re so awesome. :) Such a well thought, helpful and encouraging post. You rock! What a great article!! Love all your advice. Some of these are already on my summer list and now I am excited to actually take some time off. i love this post SO much. Especially tip #5 because you are exactly right! Everyone needs time to recharge, and those of us who don’t give ourselves this time need it more than anyone. A month off sounds luxurious and now I have it on my to-do list! Thank you, Alli!! I just LOVED this! Totally how I’ve been feeling lately, and I haven’t been at this for years so it’s hard to know what’s normal! This is so perfect, I need to bookmark this and reread it when I see those dips! It can be easy to get discouraged! But this does a great job of putting it in perspective! This is such a great post! I just stumbled upon it which was perfect timing as here in NZ I am totally in a summer slump! Awesome tips, thanks Ali! As I was looking at my traffic and doing the opposite of your #1 tip, I came across this post and just have to say – THANK YOU. Not only for the advice and strategies, which are AWESOME, but also for taking the time to share your experience on this topic. It’s not only so helpful, but also so generous. xoxo – and love your blog! Great information and I will put to use this summer! Ali, thanks for this perfect post that I can tell you wrote just for me! ;), because everything you said applies to me and how I feel EVERY SUMMER! I am bookmarking this – no, I’m printing this! so I can read it before the summer slump next year and every year after. It’s a relief to realize it’s not just me and I’m not alone. Your post is also a great reminder/motivator to do the behind the scenes stuff I put off during peak times and helps me to not feel guilty for “taking a break” when school’s out and my son wants to go do x, y, AND z, but I haven’t posted for several days and think I really should get on it. Since yesterday was Ryan’s last day of school so summer officially and literally starts today for my family, I can’t thank you enough! Have a great summer yourself and thanks again, more than you know! Thank you for this post! This is my first year blogging, and as I’ve happily watched traffic increasing over the last couple of months it has begun to slow down recently and I’ve been wondering what was going wrong. Good to know this is a seasonal pattern for the blogging industry!